Budapest is a European capital of a European country - far more European than one might expect. This year things are already dual priced in both Florints and Euros, in advance of the country's accession to full EU status in 2004. Glory, lights, success, a brilliant future. But the buildings are still dark, stone, nineteenth century, undecorated, dirty, little lit. The trams rattle passed them connecting the hills of Buda with the great flat city expanse of Pest. You say Pesht. You work at it. Get it right. And then you overhear real Hungarians on the metro saying Pest, like you used to. The language is a monster to grapple with, all whirling accents and consonants that gather in great tribes and then rush you when you are not looking. Like Finnish. Like Estonian. Nothing like any of the languages in Europe which surround it. No hint of Latin. Nothing you can recognise, hang onto. And absolutely nothing like Welsh. I'm here to launch Vizet, Water - a selected poems in Hungarian. 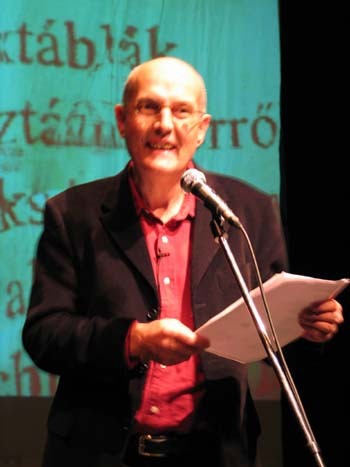 Facing page verse translations, published (with some shoving from the British Council and a translator's grant from Welsh Literature Abroad) by Konkret Konyvek, Budapest. My main translator, energy pal, co-conspirator and collection editor, Kovacs Kinga (names are always backwards in Hungary) meets me with the thing at the airport. She's in the queue waving a copy. It's fat, white, has folded in flaps bearing big coloured photos of me and her. Mine is taken in full sun on the harbour at Solfach. Hers at the Statue park. Both pieces of home. Kinga has worked through my entire output - a number published by Seren - along with a sheaf of unpublished works, to translate poems which she likes, which I like, which we both think are significant, which might work for a Hungarian audience (indeed which are about Hungary, or eastern Europe) or which are simply easy to move from one language to the other. We've travelled around the city asking each other questions. A year ago Kinga wanted to know what I meant by Bostic (it's a glue unknown in Budapest) and where was Llanystumdwy? I explain. The new versions harden up. Become new poems. The launch is at the Merlin Theatre (and again the following night in a cavern-roofed club in Pecs, pronounced PayCh - in Hungary's Mediterranean south) and is supported by Juvina, a Hungarian bottled water company. Last year my readings were supported by Kent Cigarettes and I got two Kent girls, entirely dressed in white - boots, hats, dresses, coats, gloves - handing out cigarettes, ashtrays and vouchers at the entrance. Couldn't get away with that in Wales. This time it's free water but no girls. We do the giving away ourselves. The reading is a big multi-media performance involving a whole team of Hungarian artists known as SoLit. Film overlays, back projections, sound intercuts, TV footage on a huge monitor. Videos. Me sneaking in and out of the shadows to read at the mic to an audience of 300. I do it in English and it works. Behind me projections of my poetry in Hungarian twist and turn. The British Council, who have a big hand in such things, have the new Director, his wife and Gabriella Gulyas, main literature officer, in the audience. In Pecs I get teachers and students and a Canadian in a turban who needs reassurance that his country is not America. I tell him it isn't. He buys a book. On the train back we sell another to a professor of orientalism who has found of way of getting to Teran by bus for $20 (catch it at Istanbul, takes two days). He's impressed that Wales and Hungary should be forging links. It's all down to Kinga, I tell him. Translators are what make this go. She one of the best. Vizet - Water by Peter Finch is published by Konkrét Könyvek of Budapest.